The over five-year wait between Bon Iver albums didn’t feel nearly as long as it could have. This is probably because the band’s creative force, Justin Vernon, has kept himself pretty busy since 2011. He was involved in two separate side projects that both put out fantastic records. The past two summers, he’s founded and curated a music festival in his hometown of Eau Claire, Wisconsin. Bon Iver played both years at the fest, memorably revealing new material each time. So when rumors started swirling that Bon Iver had an album coming, my initial reaction wasn’t well, finally. It was more well, that’s a welcome surprise. Back in 2012, Vernon had said the Bon Iver project was “winding it down,” presumably for a long break. With the expectation that no new music was coming, no one was hyping themselves up for another Bon Iver album anytime soon. Plus, Vernon was actually quite active during the intervening years. This is in stark contrast to the wait for Frank Ocean’s latest album, which, to fervent fans, felt like approximately four decades as opposed to the actual four years since 2012’s masterful Channel Orange. Ocean, a notorious recluse, had teased a new album multiple times, only to keep fans in the dark for years. He rarely made appearances in public and only released a few unfinished songs on his Tumblr (in addition to a few features for other artists). Finally, this past August Ocean returned with not one, but TWO albums, the visual album Endless and his third record Blonde. Ocean came through (and then some), but the four-plus year delay was hell for rabid and impatient fans. Despite an extra year of hiatus, Bon Iver’s time away didn’t feel the same way. With this in mind and as a kind of companion post to my recent article on their new album, I wanted to run through some of Vernon’s stellar work since Bon Iver, Bon Iver was released in 2011. After years of constructing gorgeous musical dioramas of profound melancholy and serenity, it was a joy to hear Vernon crack open a craft beer with his buddies and churn out a bunch of bluesy garage-rock tunes. In April 2013, Vernon, drummer Brian Moen, and Phil Cook of Megafaun, released Grownass Man under the band name The Shouting Matches. It’s far from groundbreaking; there’s no grand artistic statement here, but it’s fun as all get out. It felt like Vernon was taking a breath and kicking back after Bon Iver’s Grammy-winning whirlwind success. His haunting falsetto was mostly replaced by a relaxed baritone. While Grownass Man wasn’t going to end up on many “Best Of” year-end music lists, it did have its moments. “Gallup, NM” is a 5 and a half minute standout that demands repeated listens. Just a few months later, Vernon would release the second album under his other side project, Volcano Choir. In 2009, the members of Collections of Colonies of Bees (what a mouthful) and Vernon linked up for Unmap, an exceedingly experimental indie rock record. Then, four years later came Repave, a much more accessible, arena-ready effort. Many have claimed it’s essentially the third Bon Iver album, which isn’t totally off base considering the breathtaking melodies and Vernon’s prominent vocals. Still, each song is either too straightforwardly anthemic or just off-kilter enough that they throw you off the Bon Iver scent. Over three years later, Repave is immensely underrated. Songs like “Byegone” and “Comrade” are remarkably epic, with crashing drums and cavernous guitars. It’s the kind of music that makes you want to go stare at nature for awhile (shouts to the mesmerizing album artwork). These could almost be U2 jams if Bono’s voice were laid over them. Plus, it’s the perfect length. At eight tracks, it arrests you for just long enough before things turn stale. It’s still a wonder to me how more people, especially Bon Iver fans, don’t know about this album. It wasn’t just side project bands that kept Vernon busy, but his collaborations with other high profile artists as well. Most notably, Mr. West. Vernon was a key contributor to Kanye’s 2010 maximalist opus, My Beautiful Dark Twisted Fantasy, so it was no surprise when he brought Vernon back in for 2013’s Yeezus. The bleak, hyper-aggressive posturing of that album might not seem a natural fit for the “Skinny Love” guy, but Vernon has a writing credit on three of Yeezus‘ tracks, proving Kanye and Vernon a formidable team yet again. Another critically acclaimed collaborator was James Blake. The two have worked together for years, but on Blake’s The Colour in Anything, released earlier this year, Vernon is one of only two co-writers on the album (The other? Frank Ocean). Vernon’s name can be found credited on three songs, including a feature on the slow-burner “I Need a Forest Fire”. Come 2014, we were treated to the first new Bon Iver track in three years. “Heavenly Father” was created for Wish I Was Here, Zach Braff’s Kickstarter-funded film. It’s a buzzing, captivating few minutes of music that stands on its own, even without the context of a full album. It was a welcome reminder that Bon Iver could still grab your attention out of nowhere. 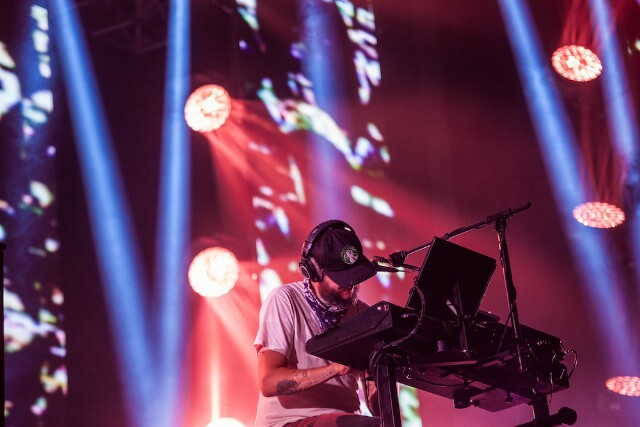 In the summer of 2015, at his own music festival , Eaux Claires, Vernon awoke the Bon Iver machine for a live performance. In it, they performed two previously unheard songs, stoking speculation that a new record was on the way. The first, which I’ve watched roughly 3,482 times on YouTube, would become “666 ʇ”, the sixth track on 22, A Million. The other, featuring the sister folk trio, The Staves, is unaccounted for on the new album. Hopefully it sees the light of day somewhere down the road. It turned out we would have to wait a full year for more new tunes. At next year’s Eaux Claires fest, Bon Iver returned and played 22, A Million in its entirety. With the studio version coming out on September 30th, our (not so terrible) wait is over.